Fine steaks and Southern cooking are at the heart of the action in this downtown Nashville establishment. : The first thing you should know about The Southern Steak & Oyster is that when it comes to steak, you’re the boss. You have the option of selecting not just how you want it cooked, but how thick it is, plus what part of the cow it comes from. The kitchen takes pride in impeccably fresh seafood as well as rich nouveau Southern dishes, such as smoked duck with sweet potato hash and roasted Brussels sprouts. Locals like the chicken-fried chicken and the shrimp and grits. 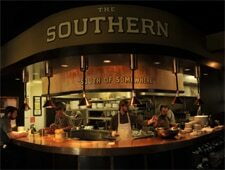 The Southern has breakfast, brunch and lunch covered, too. You can get chicken and waffles for breakfast, and a very fine omelet made any number of ways. The wine menu is not particularly spectacular, but it’s got enough variety to get the job done. For dessert, do not miss the hummingbird cake, a Southern classic made with raspberry sauce and fresh whipped cream.